Miley Cyrus doesn't have a patent on sticking her tongue out, but that—and twerking, obviously—has pretty much become her signature move. 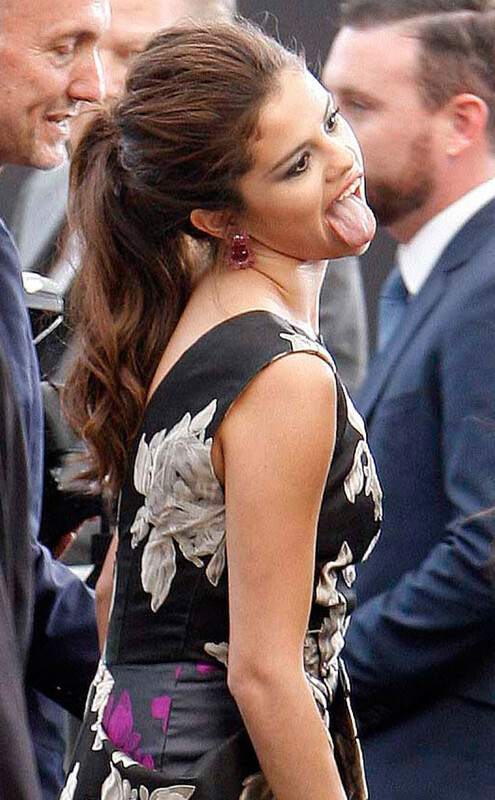 So when Selena Gomez had her mouth wide open and her tongue hanging out on Monday, Aug. 26, at the premiere of Getaway in L.A., we couldn't help but wonder if she was paying homage (or let's be honest, completely mocking) Miley's raunchy performance at the 2013 MTV VMAs just two nights before. The former Hannah Montana star's suggestive, crotch-centric dance moves and vulgar gestures with a foam finger have been constantly scrutinized since she and Robin Thicke shared the Barclay's Center stage in Brooklyn on Sunday, Aug. 25. Selena, 21, has never presented herself publicly in quite as provocative of a way, but she didn't seem to be bothered by the raunchy performance. In fact, MTV's Audience Cam showed Selena and BFF Taylor Swift singing and dancing along to "We Can't Stop" as Miley, 20, stripped down onstage. At one point Taylor, 23, and Selena appeared to be surprised—or perhaps in awe—of the erstwhile Disney darling's performance, but at no point were they captured making fun of her teddy bear onesie or flesh-colored latex lingerie. Oh yeah, and Selena's a twerking pro, too. She actually taught her Getaway costar Ethan Hawke a few of her booty-poppin' moves. Maybe—just maybe—Selena and Miley are due for a twerk-off.